Avenged Sevenfold Live In Prague, Czech Republic – Photo Round-Up. Avenged Sevenfold performed live in Prague, Czech Republic at Aerodrome Festival on June 17th, 2014. Photo galleries from the event can be found here. Please check back regularly for updates. – Avenged Sevenfold’s photo set from their show in Prague, Czech Republic. – MusicWeb.cz‘s Avenged Sevenfold live in Prague, Czech Republic photo gallery. More at Katka’s link. – Koule‘s Avenged Sevenfold live in Prague, Czech Republic photo gallery. – Katka Hajdinová Photography Avenged Sevenfold live in Prague, Czech Republic photo gallery. – Mirek Valenta rockphoto‘s Avenged Sevenfold live in Prague, Czech Republic photo gallery. – Monster Music‘s Avenged Sevenfold live in Czech Republic, Prague photo gallery. Pages 2 & 3. – Petr Tibi‘s Avenged Sevenfold live in Prague, Czech Republic photo gallery. 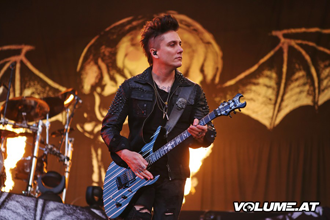 – Volume.at‘s Avenged Sevenfold live in Prague, Czech Republic photo gallery. Pages 1 & 3. – Elecktropiknik‘s Avenged Sevenfold live in Prague, Czech Republic photo gallery. – Darkroom Abyss Zine‘s Avenged Sevenfold live in Prague, Czech Republic photo gallery. – T Music‘s Avenged Sevenfold live in Prague, Czech Republic photo gallery. Pages 1, 2 & 3. – Niwy Kováčová Photography‘s Avenged Sevenfold live in Prague, Czech Republic photo gallery. ← TechRadar: M Shadows On Hail To The King: Deathbat + Avenged Sevenfold's New DVD Title. TechRadar: M Shadows On Hail To The King: Deathbat + Avenged Sevenfold's New DVD Title. Avenged Sevenfold On 'EA Sports UFC' Soundtrack.